Avantivarman was an illustrious ruler , loving peace and care of his subjects. This enabled the land to be well irrigated and made the country fertile. Agricultural production was at its height and economy developed fast. Avantivarman built two great temple at Avantipura, one to Vishnu named Avantiswami and the other to Siva named Avantisvara. The situation became still worse as there was siege of the temple by the feudal lords named Damaras. As Avantipur was on the main route to Srinagar, the kings used the town as a halting place. The Vishnu temple has a central sanctum tower with preceding mandapas, inside a rectangular prakara with a large number of Cells and preceded by a gopura. The temple is conceived as a pancayatana temple with four additional small temples around the main sanctum tower.. There was also a garuda sthambha in the complex. A corresponding niche carries another portrait probably of Avanti varman or his predecessor. This represents a four face Vishnu known as Vaikunta, Chaturmurti or Cahtur vyuha. This Vishnu with his right face s a lion, and theleft as a varaha and the front one as Vasudeva is the finest of Kashmiri images. It is said that the other four smaller shrines around the main shrine were dedicated to Samkarshana, Aniruddha, Pradyumna and also Vasudeva with the central main image representing Chatur vyuha-Cahturmurtii. There is a sculpture of Lakulisa and another a portrait of Avanti varman himself. Both these temples have suffered extensive destruction in the hands of the Idol destroyer Sultan Sikander. Dr. Nagaswamy visited Avantipur recently as part of His Holiness' entourage during the recent yatra of His Holiness to Srinagar and surrounding places. 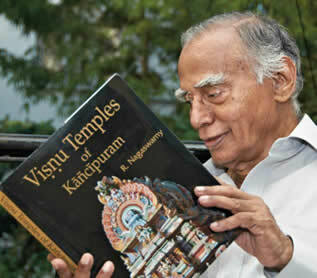 Dr. Nagaswamy is an eminent Archaeologist and the First Vice Chancellor of Shri Chandrasekharendra Saraswathi Viswa Mahavidyalaya. His full bio-data is available here. A Maternity home established by A Hindu Queen of 13th Cent.